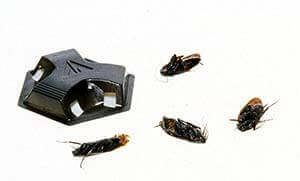 Did you know there are actually three different kinds of cockroach baits? Probably the most well-known of them all are bait stations (like these Dupont Advion Bait Stations often used by professionals). Bait stations are usually used for indoor applications. The killing agent–active ingredient–can usually be found on the label. There are only a few of them out there that is commonly used in roach baits; Fipronil and boric acid are the two most popular. The attractant on the other hand is usually not disclosed. Manufacturers aren’t required to disclose this information, so the active ingredients usually remain a closely guarded trade secret. The enclosure is usually made of plastic, cardboard, or sometimes a combination of both. It will usually have small openings on the sides for cockroaches to enter and leave. You want them to be able to leave, so they can return to the nest and poison the other roaches there. This is the domino effect that makes baits so effective. Using base stations is an easy task. Just take them out of their packaging and place them in high traffic areas. Make sure you place them in areas where children or pets will not be able to gain access to them. Also make sure you read the instructions on the packaging first. One good thing about them is a handful of these can be used to easily cover a large area. If you choose to use granular baits make sure you don’t expose it to water, or moisture. One reason why you shouldn’t use them indoors is because kids and pets will easily mistake them for food. Their curiosity is also going to get the best of them and they might attempt to eat them. Fewer limitations to where you can place them. It will stick to most surfaces. In fact, you can apply it almost anywhere in the house. Although some places are better than others. More economical. One tube is enough to treat an entire average sized kitchen. They stay moist for a very long time. The moisture helps to attract roaches because cockroaches love moist foods. Easier for baby and juvenile roaches to eat. Many times juveniles and baby roaches are not able to eat hard baits because they’re too hard to chew. However, gels don’t have this problem because they’re much softer. The most common and easiest to use of these three are those that come in a syringe. Bait guns are usually used exclusively by professional exterminators. This is because the guns can be a little pricey and buying it for just a few treatments is a complete waste of money. For easy applications, try the syringes to get bait into cracks, holes and other small spaces. Make sure you get one with a small application tip to be able to get into those small openings. For indoor use, use gel baits and bait stations. For outdoor use, go with granular baits. There’s really nothing stopping you from using all three, but that’s overkill and indeed–not to mention a complete waste of money. Choose one and stick to it for a while. Change brands or to a different type if results don’t turn out too well.